Buckskin made from deer hides is buttery soft, wonderfully flexible and useful for endless purposes. It’s also something you can make using only resources that nature provides. 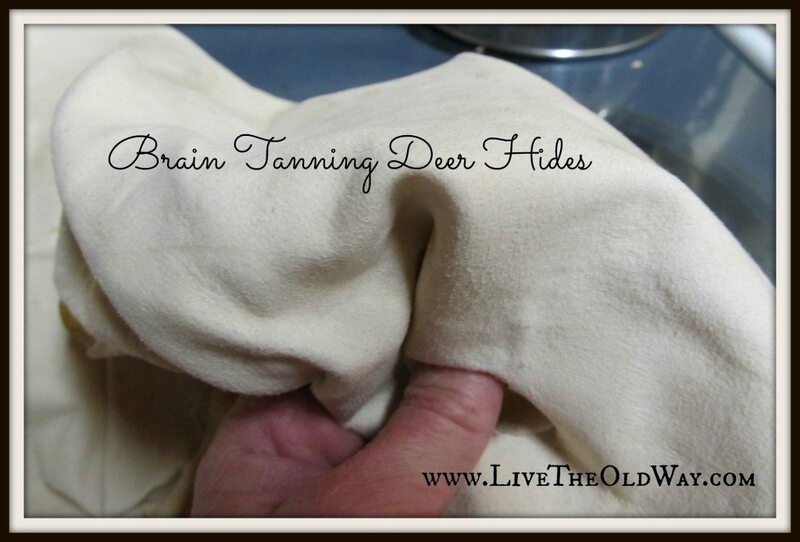 Brain tanning deer hides is an exciting and really, really rewarding process. The finished product, “Buckskin”, is not named for a male deer (a Buck) but is named for the process of putting the hide in a lye solution called “buck or bucking”, so the hide can be anything, not just a deer. 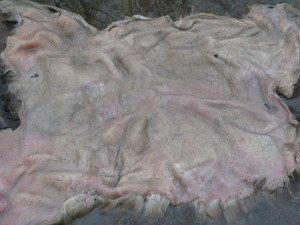 Brain tanning is one of the more common ways of finishing the hide and oddly enough, the brain of an animal is typically exactly enough to tan the amount of hide it carries. The ability to make your own buckskin adds value not only for people interested in making use of every part of an animal that will feed their family, but also for the prepper community and as a bartering tool. I have a tutorial below with a lot of steps, but please don’t be turned off by how much of a process it is. It’s really not that difficult because each step is only a little something that you have to do with a wait of anywhere between 1 and 5 days before you move on to the next step. It’s like some of my favorite recipes that can be started and have several opportunities to stick it in the fridge and get back to it later. I highly recommend the book Deerskins into Buckskins: How to Tan with Brains, Soap or Eggs; 2nd Edition by Matt Richards. He gives some superb detail and a ton of why’s to go along with the how’s. 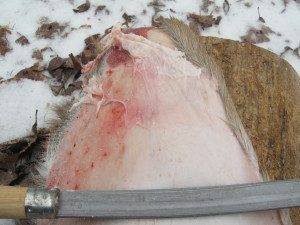 When brain tanning deer hides, or when using any method for that matter, pulled hides are usually better than knife skinned hides. Knife skinned hides bear the danger of containing week spots or holes created by knife strokes, some that you won’t know about until you start the drying/stretching process and all of a sudden you’ve pulled a hole in your hide. The holes can be sewn, but it’s better just to avoid having them to start with. Some holes, like from a bullet entry, obviously cant’ be avoided. Another useful tidbit to know is for a deer, trim the hide around the color line, or where the brown hair turns to white at the belly. Belly skin is thinner and more fragile and doesn’t tan well. As far as the beam goes, using a 6-8″ diameter beam gives your tool better purchase on the hide and offers a solid place to work. Choose a beam that is long enough to lay at a 45 degree angle and wind up about waist height. 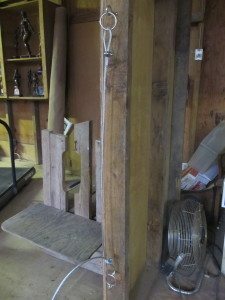 Position the beam pointing down with the higher end laying between a tree fork or over a saw horse. Hold the hide still by draping part of it over the upper end and leaning your abdomen against it, repositioning the hide as you work new areas. This makes the push motion easier too because you can get your whole body into it. Also, the scraps come off much easier if you work side to side than down the length of the hide (neck to rump). It doesn’t seem like that should be so, but it is. 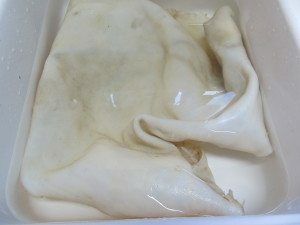 Once the hide is fleshed, you’ll be soaking it for several days in a lye solution. 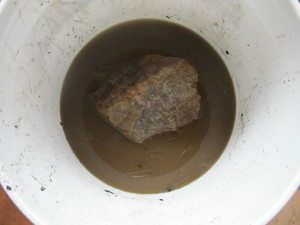 The method for making your own wood ash lye is described here: http://livetheoldway.com/making-lye-from-wood-ashes/. 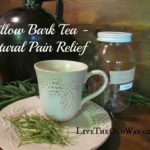 You can also use store bought lye and mix it in the same manner, floating an egg to determine the strength. You’ll want at least a couple of gallons of whichever lye solution you choose. 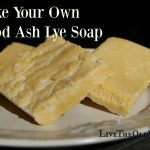 If you choose store bought lye, you can get it here: Food Grade Sodium Hydroxide Lye Micro Beads, 2 Lbs. for about $4 plus shipping. 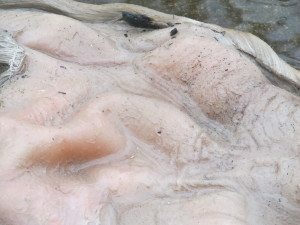 By soaking the hide in lye, you will be removing the hair and penetrating the skin layers to clean out the mucus in between them so that in later steps, the oil from the dressing (brains) can completely penetrate the hide. This soaking also makes removing the grain possible in the next step. Make sure you press the hide down well into the buck to coat it completely. You may want to lift it, rearrange it and press it in again to make sure you’ve got all areas wetted. Once thoroughly wetted, place a plate on top and weight it down if necessary to hold the hide in the buck. Here I have used a large rock on top of the plate to make sure it stays submerged. Let the hide sit between 3 and 5 days so that the buck can completely penetrate. You’ll know it’s ready when the hide appears swollen and has turned a brownish-tan-yellow color. Hides that have areas not yet swollen (typically over the neck and spine are the last) or are blueish or white, need to soak a little longer. It won’t hurt anything to over soak it if you’re unsure. Better over soaked than under soaked. The hide shown above is sufficiently swollen and has lost the blueish color. It’s hard to tell from the photo, but it has the brownish-tan-yellow color. If you have more than one hide to do, you can save this lye solution and use it over and over as the soaking won’t hurt it’s effectiveness. 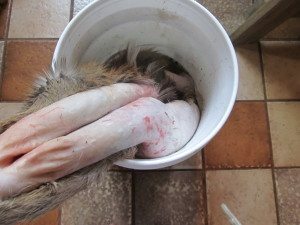 Catch all the excess back in the bucket when removing the hides and you can save a lot of work making the solution over again every time. Rinse the hide off with a hose, in a bucket, creek, whatever you have available. It’s ok if the hair comes off, just make note of which side is which for the next step. It’ll be pretty obvious once you look closely at the differences in each side. Place the hide, hair side up, back on your scraping beam. At this point you will be removing the grain and remaining hair follicles. You’ll have to really get in there with your scraping tool, so don’t be afraid to put some force into it. You’ll be hard pressed to do any damage to the hide, it’s very tough and you’ll need to go deeper than you think to make sure you get into the grain and not just sheer the epidermis off. Below, you can see not only the line where the grain is removed, but also white marks made by my scraping tool where I bit down with the edge to get deep enough. These marks are only temporary and won’t show once the hide is finished. Like the fleshing step, work side to side for easier removal. For this step, you can use a bucket or tub that you change the water in multiple times, or place the hide in a lake or moving water so that no manual water change is necessary. 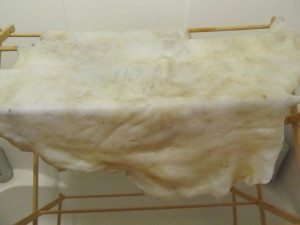 The rinsing removes the remaining lye from the hide and mucus from between the interior fibers of the hide that would cause it to be stiff once finished. 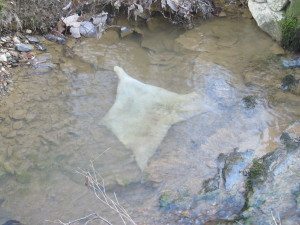 I use our creek and place a rock on the hide to hold it in place. Let the hide rinse at least overnight. You’ll know it’s ready when it no longer looks swollen. It also helps to pull it out periodically and hand stretch in at least two directions. Acidifying the hide is one of the steps that makes the hide so super soft at the end. To acidify it, place the hide in a solution of 4 gallons warm (not hot) water and 1/2 cup vinegar. You can use either store bought white vinegar or apple cider vinegar. In the picture below, I’ve used apple cider vinegar that we made a couple of years ago and you can see that the color of the vinegar makes absolutely no difference when added to that much water. Soak it for only 15-20 minutes, then remove. 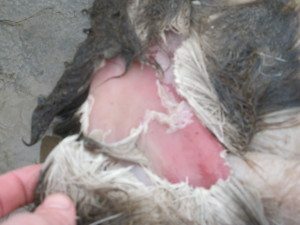 Take your hide back to the scraping beam and remove any remaining membrane from the flesh side. There may or may not be anything to remove depending on how thorough you were in step one. The previous soakings will make anything leftover very visible at this point. This also gives you a chance to clean up any discoloring from the wood ash lye or sediment if you creek washed. Re-scraping the membrane will have squeegeed out much of the water from the hide, but you’ll still want to wring it to really get down into the fibers and also stretch them out a bit so that the dressing (brains, eggs, etc.) can penetrate in the next step. 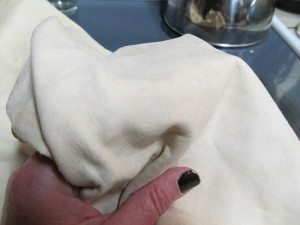 You can do this by hand, then pull the hide in all directions to stretch it open. Hang the hide for about a day until it is mostly but not completely dry. Once the hide is mostly dry, it’s time to put it in the dressing. 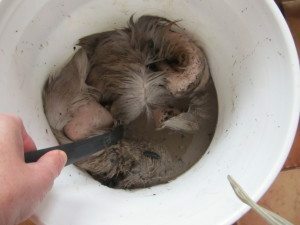 If you saved the brain of the animal and are going to truly “brain tan”, take the brains and mix into 1 cup of warm water. 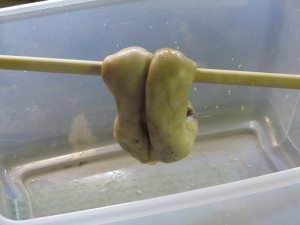 You can use your fingers, an egg beater or a blender to make the mixture into a paste. Then add your paste to 1/2 gallon of warm water in a bucket large enough to hold all the liquid and your hide. I use the same 5 gallon bucket that I bucked in, washed of course. The hide below was done using eggs because we have them abundantly. The egg method is one dozen beaten eggs added to 1/2 gallon of water. Use warm water, not hot. The hide is flesh like your skin, so if the water is too hot, it will do the same thing to it as it would your flesh. Let the hide soak in the dressing anywhere from an hour to overnight. 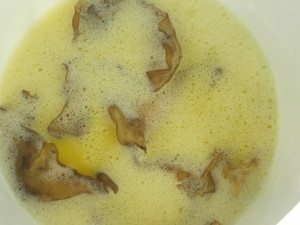 Longer is better so that the dressing has time to soak in thoroughly, but keep in mind that the brains and especially eggs, left out in warm air, will begin to smell if you don’t start the drying process within about 12 hours. Now it’s time to wring the dressing out of the hide. You can do this on a tree limb or with two sticks. Prepare the hide for wringing by draping one end over your stick or branch. Pull the other end up and drape over the top so that you’ve created a loop. Start rolling the hid inward from both ends until you have it rolled like the first picture below. Insert a second stick through the bottom of the loop and begin to twist. Don’t be afraid to really crank down on it. You can see how the color of the hide has changed after soaking up the dressing. Once the excess dressing has been wrung out, unroll it and hand stretch it back out to it’s original shape. 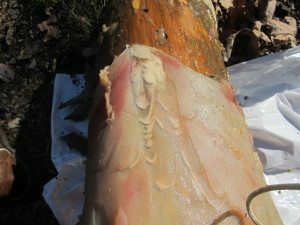 At this point, you will begin the process of stretching the hide on a branch or cable until it is completely dry. This takes several hours depending on the temperature. If it’s a warmish day and you’re outside, it will go quicker than if it’s cold or you’re indoors. A sturdy branch works just fine for stretching, but a 1/4″ cable with a little slack in it is an awesome way to do it. 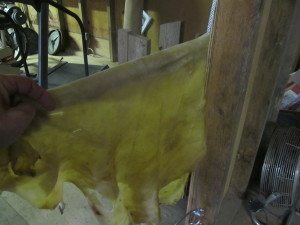 The purpose of stretching the hide as it dries is to keep the fibers moving so that they don’t dry stuck together, making the hide hard and stiff. 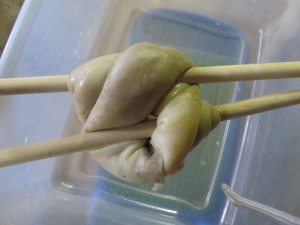 Drape the hide around the cable and using your hands and body weight, pull it methodically, working each section, alternating between side to side and lengthwise. The cable is good because you can also periodically saw the hide back and forth, abrading the surface, which gives the finished product a nice look and takes care of any leftover long fuzz on the membrane side. I’m only using one hand below because I had to take the picture with the other, lol. Notice the bit folded over at the top, this is the part that I was pulling, as I finish with that, I fold down a little more and pull again. The hide will be stretchy and you’ll need to continually turn it from pulling side to side, to pulling it lengthwise to keep the fibers moving as it dries. Keep pulling the hide until it no longer feels cool in your hands. Sometimes it’s hard to tell if the hide is completely dry or not, but if it’s still cool to the touch, it’s probably still got some moisture in it. Stopping before it’s completely dry will result in a hide turning stiff even though it feels super soft when you stop. Anyway, now that you’re done, think of all the things that can be made with this beautiful gift from nature; clothing, satchels, blankets, shelters, knife or gun sheaths, the sky is the limit. You will have provided your family with an essential commodity and possibly even a life saver. Ann, You’re amazing! 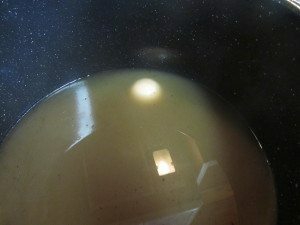 I’ve only used lye for making soap. The whole process is so fascinating to me. Thanks for sharing the details. My boys have been wanting to try tanning on their own. Hi Dave! Are you using brains or store bought tanning solution? I have tanned 8 deer hides in the past 6 months. No problems at all….till today that is. After sitting in the tanning solution, I could not get it to wring out to save my life. Every time, when I twisted, the hide would slide and come loose. I even tried drying in between towels, then hanging, rolling and twisting again. Still could not get it to stop slipping. Any idea what the problem is? Thanks for your time. This is fascinating! We have lamb hides we would like to try to tan but we want to keep the wool on most of them. I’ll have to check out the book too. 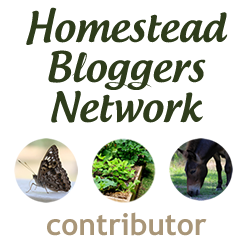 Thanks for joining the Homestead Blog Hop! Awesome post! Thanks so much for this.